If your pet is found, please contact us by email or by calling 776-3326 to have your pet removed from the pet patrol. 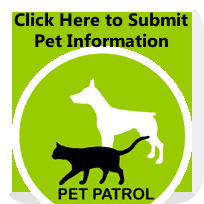 Pet information will remain on the pet patrol for one month and then be removed unless otherwise notified. Changes to this page may take up to 24-hours to appear.